The stationery and gift items here feature a reproduction of John James Audubon's White-winged Crossbill (Loxia leucoptera). The bird is also known as the Two-barred Crossbill. 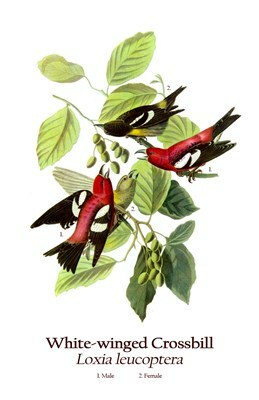 The original illustration was published in his famous work "The Birds of North America". To order by phone, call toll-free at 1-877-809-1659 from Monday - Saturday 9:00am - 9:00pm EST. You'll need to note the Product Number 030-240665469 to make your order.